I adore exploring the diverse and booming restaurant scene in Chicago. There’s nothing quite like that moment when you realize you’ve found something special. It can arrive in a variety of ways, from the bustling atmosphere, a servers warm smile and accommodating nature, the first sip of a craft cocktail or even a pleasant surprise when the bill arrives. We all know that moment, it’s the moment when you remind yourself mentally (or via the notepad app in your iPhone) that you must return for a second time. But what about those restaurants you find yourself returning to a third, fourth and fifth time? What is it about those restaurants that make them so special? Is it the food? The reasonable prices? The cute wait staff? For me, it’s about reliability and consistency. Knowing that whenever I return, I’m bound to not only get a delicious meal, but a wonderful experience as well. I first discovered Milk & Honey Cafe about three years ago when I first moved to Wicker Park. It was a 2 minute walk from my apartment and served great coffee. It’s always busy, especially on weekends. It’s an intimate cafe with less than 20 tables. One large chalkboard fills a wall, sprinkled with their list of sandwiches. Another smaller chalkboard features their breakfast menu. They have a glass case full of daily rotating pastries, namely nutella scones, blueberry muffins, raspberry bars, homemade granola, croissants, cookies, etc. I’ve found that in my many, many visits, it’s the perfect spot for a working coffee date, solo breakfast, quick latte to-go or a consistently fabulous weekend brunch. 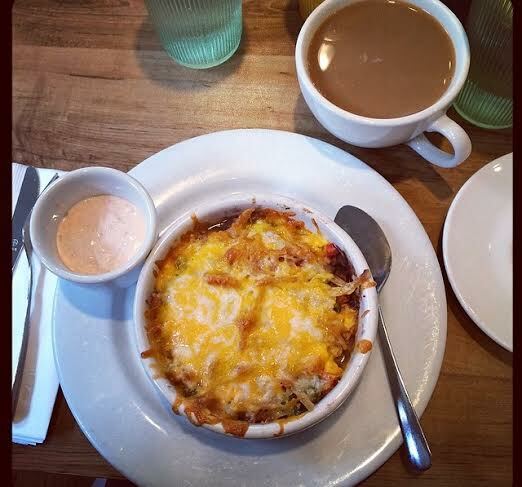 A brunch favorite: Huevos Rancheros- “Casserole-Style” with Scrambled Egg, Black Beans, Salsa Picante, Corn Tortillas, Monterey Jack and Cheddar Cheese (served Sat & Sun only). 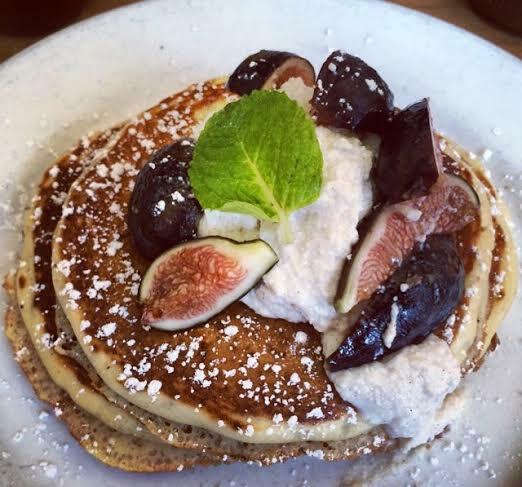 They have weekly pancake specials: this particular one featured Whipped Ricotta & Black Mission Figs. Same with waffle specials. 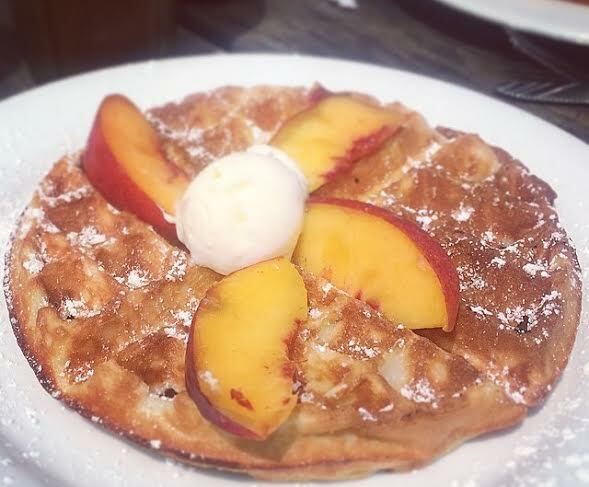 This one was topped with fresh peaches. Perfect in the summer, sipping iced coffee on their patio. It wasn’t until a summer day two years ago when, after running errands with my mom, we were driving down Division St. and found ourselves ravenous. I suggested running to Milk & Honey and grabbing a quick bite to-go. 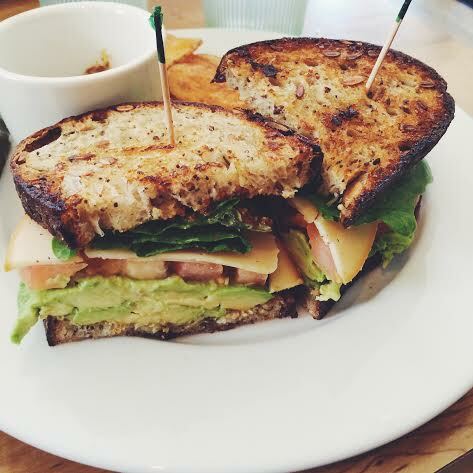 I returned with a sandwich I’d never had before, something simple I knew we both would enjoy: the Avocado, Smoked Gouda, Romaine & Tomato with Cracked Mustard. We were skeptical, but starving. We probably would’ve eaten anything at that point. After one bite, I had my moment. It was silly at the time, but we seriously just sat there in the car, astonished that a sandwich this plain-looking could be so satisfying and addictive. A few weeks later, I decided to recreate the sandwich at home. It was definitely one of the better decisions I’ve made. I love that you really can do your own thing with this sandwich. 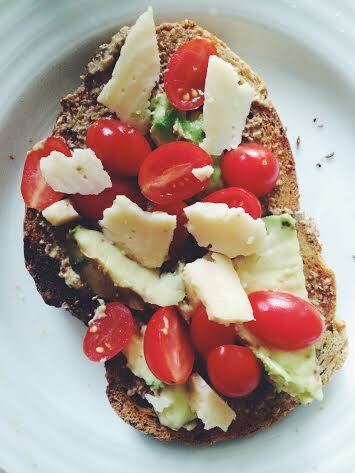 There have been times when I’ve made it without lettuce, open-faced with just avocado, smoked gouda, mustard & tomatoes (photographed below). If you don’t like the smokiness of the cheese, I’d suggest using a milder, semi-soft cheese or even a white cheddar. The options are practically endless! While I definitely still venture over to Milk & Honey quite often (was there twice last weekend and this past Tuesday), it’s pretty great knowing I can have this sandwich whenever my avocado-loving heart desires. Toast two slices of multi-grain bread. 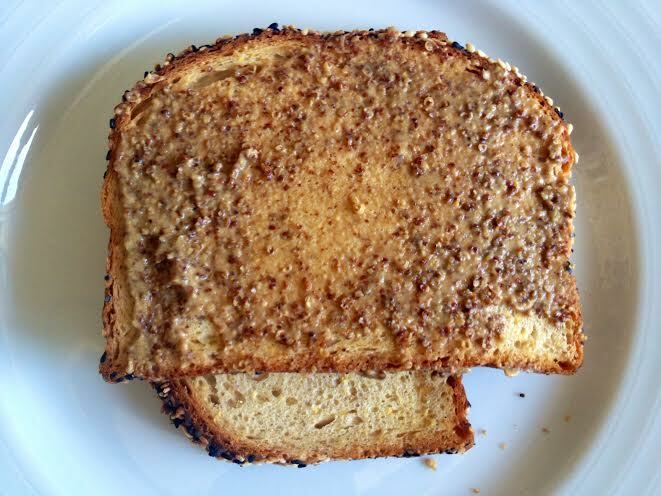 Spread 1/2 tablespoon of grainy mustard on one slice, 1/2 on the other. Keep additional mustard for dipping. 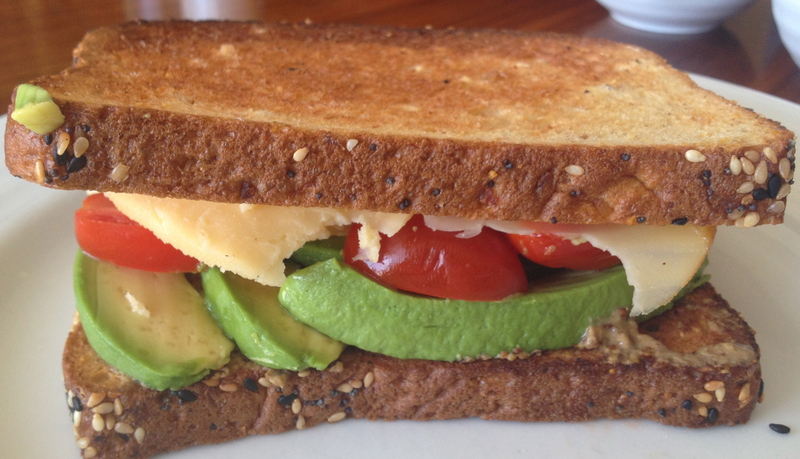 Place avocado on the bread first, slightly season with salt, pepper & chili flakes, then assemble the sandwich, adding tomatoes, cheese and finally lettuce. Enjoy!